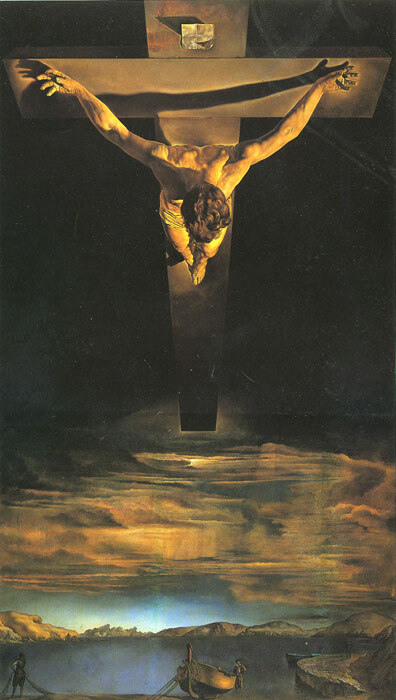 By far the most popular of all Dali’s religious paintings is without a doubt his Christ of Saint John of the Cross, whose figure dominates the Bay of Port Lligat. The painting was inspired by a drawing, preserved in the Convent of the Incarnation in Avila, Spain, and done by Saint John if the Cross himself after he had seen this vision of Christ during ecstasy. The people beside the boat are derived from a picture by Le Nain and from drawing by Velázquez for The Surrender of Breda. At the bottom of his studies for the Christ, Dali wrote: "In the first place, in 1950, I had a ‘cosmic dream’ in which I saw this image in color and which in my dream represented the ‘nucleus of the atom’. This nucleus later took on a metaphysical sense; I considered it ‘the very unity of the universe’, the Christ ! In the second place, when thanks to the instructions of Father Bruno, a Carmelite, I saw the Christ drawn by Saint John of the Cross, I worked out geometrically a triangle and a circle, which ‘aesthetically’ summarized all my previous experiments, and I inscribed my Christ in this triangle." This wor was regarded as banal by an important art critic when it was first exhibited in London. Nevertheless, several years later, it was slashed by a fanatic while was hanging in the Glasgow Museum, proof of its astonishing effect on people. Dali relates that, when he was finishing the picture at the end of autumn in 1951, it was so cold in the house in Port Lligat that Gala abruptly decided to have central heating installed. He remembers the moments of terror through which he then lived, fearing for his canvas on which the paint was still wet, with all the dust stirred up by the workmen: "We tool it from the studio to the bedroom so that I could continue to paint, covered with white sheet which dare not touch the surface of the oil. I said that I didn’t believe I could do my Christ again if any accident were to befall it. It was true ceremonial anguish. In ten days the central heating was installed and I was able to finish the picture in order to take it to London, where it was shown for the first time at the Lefevre Gallery." When it was at the Biennial of Art in Madrid, along with other works of the painter, General Franco asked that two of the oils of the master of Figueras be brought to the palace of El Prado - Basket of Bread and Christ of Saint John of the Cross. SPECIAL NOTE : The painter will make the reproduction as close to the original oil painting as possible. If you want your painting to alter from this likeness, please email us and " Christ of St. John of the Cross, 1951 " will be reproduced according to your special requirements.